At the corner of Brazos St. and 17th street in West Columbia, Texas you will find a Walgreens Pharmacy. If you are ever passing through West Columbia, you need to be sure and stop in at this Walgreens. Not because it is any different than any one of the hundreds of other Walgreens that you can find all across, the state of Texas, but because it is located on the same town lot as the First Capitol of the Republic of Texas. If it were not for a group of West Columbia citizens concerned with the preservation of Texas history this would just be a Walgreens parking lot. Through their efforts you will find a 30 feet wide by 337 feet long linear park that runs parallel to Brazos St. in front of Walgreens. 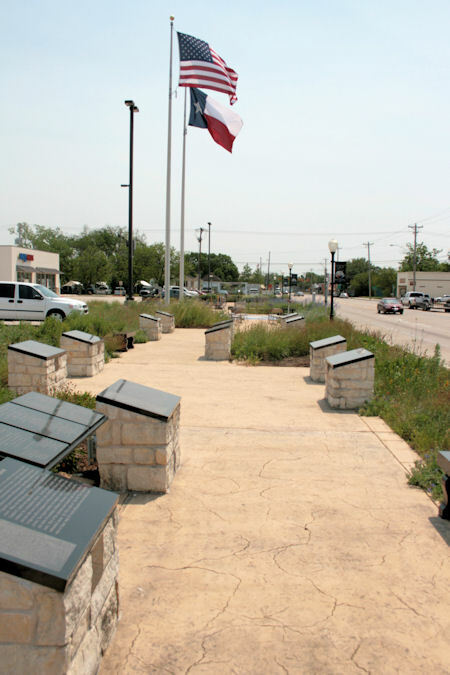 It has 21 historical markers, each giving a short narrative of a person, place or thing that had a significant impact on the birth of the Republic of Texas. Starting at the West end (Right at the northeast corner of 17th and Brazos Street.) walk down the 10 foot wide sidewalk that ties all the Historical Markers together. Read each marker, and in a about 20 to 30 minutes you will learn a lot about the Republic of Texas. The park is landscaped in native plants and grasses. All indigenous to Brazoria County. There are also several benches along the way. When I was there I went into Walgreens and bought a pint of Blue Bell ice cream, sat on a bench, looked at the wild flowers and ate my Rocky Road.